In the mid-1980’s reports of the increasing destruction of the Amazon Rain Forest alarmed people around the world. In 1992, following an initiative by the German government, the leading industrial nations initiated PP-G7, a pilot program to conserve 160 territories of the Brazilian Rain Forest. Funds contributed by the G7 enable Brazilian Indian tribes to mark and preserve their own territories. 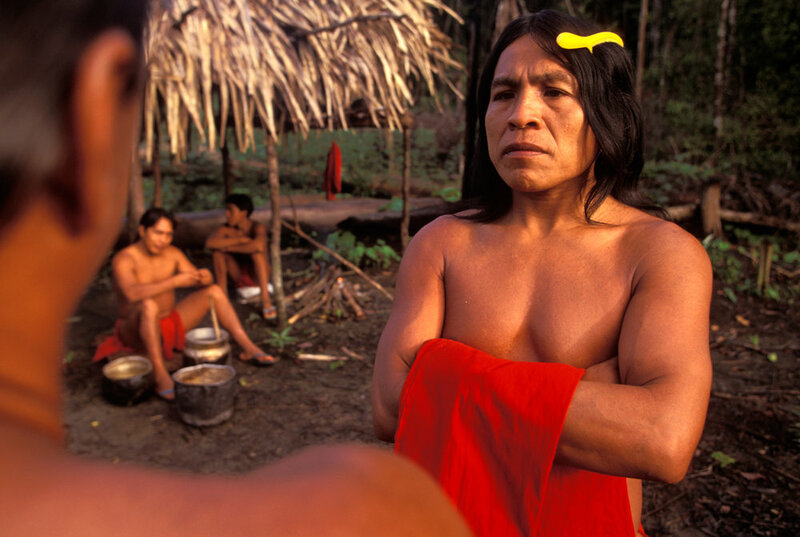 In return, the Brazilian government agrees to prohibit non-indigenous people from entering without a special permit; keeping out loggers, gold-diggers, and any enterprises that destroy and deplete the rainforest. As Indian tribes traditionally harvest and use only what is necessary for their survival, they thereby preserve the Brazilian rainforest’s biodiversity. Among the 160 Brazilian Rain Forest territories is the Waiapi reservation, located in Northeast Amazonia. It is inhabited by 400 people and stretches across 6,070 square kilometers. Prior to the effect of the PP-G7, survival of the Waiapi Indians was threatened; they were deprived of all rights and even killed by loggers and gold diggers. With the security of the program, they have now become the guardians of their own reservation and are able adapt to Western influences at their own pace.